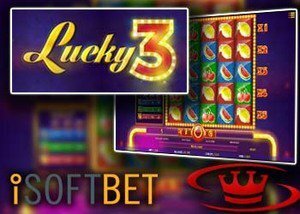 iSoftbet, an Internet game supplier, has just launched its latest slot, Lucky3, a game based on the popular combination of fruits. Filled with color, this slot brings together five reels with five rows of tasty delights and the glitz of bright neon lights. The new iSoftbet slot offers a classic approach to the time-honored fruit style machine with the usual combination of fruits such as watermelons, cherries, and lemons. It includes a jackpot of 500 coins, and its 5x5 format gives it a classic feel, but with a new approach that is retro in nature yet new to many. This slots biggest feature is its multipliers. This makes it far more electrifying as each reel will see the multiplier increase by one, and can award up to a 5x multiplier. This comes into effect when its bonus game is awarded and can reward rather handsomely. Its other main attraction is its jackpot feature, awarded when five lemons of the 5th payline will see wins multiplied by 20x and award 500 coins. The classic allure of Lucky3 can be enjoyed at our recommended casino, Casino 777. Our bonus review includes all the information you need to learn about the excitement that awaits behind this casino's proverbial doors. Starting with its sign up bonus of 100%, with it offering up to $777 in bonus funds. Of course, highlighting the iSoftbet No Deposit Bonus of 25 free spins is a nice touch. It is always enjoyable to receive a no deposit bonus from a casino site, especially when faced with a long list of highly regarded game developers. Licensed in Belgium, owned and operated by Ardent Group, Casino 777 offers an abundant and never ending supply of casino games to keep players entertained. This includes many of the world's best suppliers such as Ainsworth Game Technology, Amaya Gaming, ELK Studios, Evolution Gaming, IGT, iSoftBet Ltd, Microgaming, and NetEnt. Those looking for unique games will enjoy the likes of Thunderkick, Playson and Pragmatic Play. Register today and experience the different selection makes!